Summary: A mysterious man has recently landed on Themyscira, and it has all the women on the island all shaken up as his arrival coincides with the loss of their captain of the guard, Alcippe. Who is this mysterious man and where does he come from? Why is Antiope so eager to kill him and why is she conspiring against her own sister? 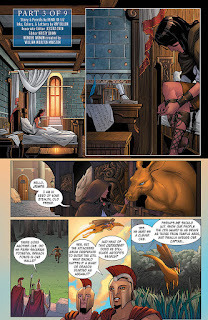 What dark, deep secret is the mighty Queen Hippolyta hiding if she is aware of all the dangers her daughter, Princess Diana, has been sensing on the island all along? The various conflicts begin to converge as Diana begins to question her priorities and her place in the society that has made her the woman she is, and the journey she soon has to embark. Is her place truly by her mother's side, or do the gods will her to fulfil a completely different destiny from the one that's been decided for her since birth? These are all questions Diana has to answer for herself as she faces her first real trial as both the champion of Themyscira and as a woman of honour. The perils that she faces soon take her out of the safety of Themyscira and into wilderness of the outside world, and onto the shores of Boston Massachusetts, 1944! 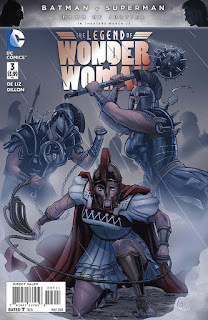 Review: The last two issues of Legend of Wonder Woman took us to the island of Themyscira and explored the world that shaped the history, culture, and society of the Amazons, as well as how all of these in turn shaped Diana's perception of both herself and the world around her. In this issue, we are introduced to the presence of another world with the arrival of Steve Trevor, and in this issue, we start to see the beginning of worlds colliding. We see Diana experience two important trials in her life: how she fares as a warrior and as a representative of her people in the eyes of her people, as well as how she fares as a foreign entity existing in a world that is radically different from Themyscira. Conflict envelopes at every corner of the world, and we see--from Diana's perspective--not only the extent of the conflict that exists at and beyond Themyscira's borders, but we also see for the first time just how much time has actually progressed outside of the island with the present year being established as 1944. Does time run differently on Paradise Island, or has life on Paradise Island made it seem like time stood still? Undoubtedly one of the biggest questions that must have flowed through Diana's mind when she saw what year it was and how it must've drastically differed from the Greek calendar. 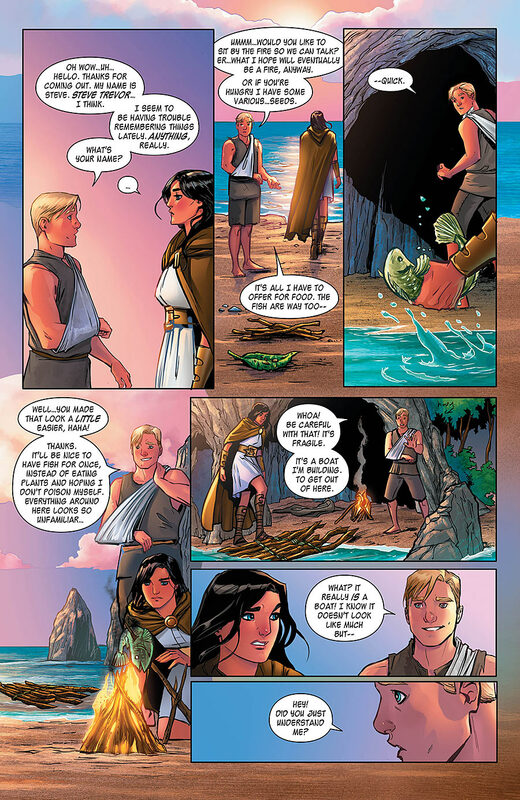 With the theme of worlds colliding introduced in this issue, one of the most curious developments that happened is the establishment of character Steve Trevor understanding the version of the English language Diana spoke when she interacted with him for the first time at the start of this issue. This is very significant considering how closed off Themyscira has been over the centuries, and none of its inhabitants bore witness to all of the changes and transformations the world has gone through since the Greek gods retired their presence from the entire planet. From an historically geographic standpoint, the English language was definitely not what it was when the Amazons last saw the outside world. In fact, it didn't even exist at all! During the time of Ancient Greek civilisation, the islands that would eventually become the United Kingdom were occupied by various Celtic tribes--different groups of people who spoke very different languages and had very different cultures. It was through the numerous invasions of these islands by various European empires that we eventually got the English language as we know it, and the countries like England, Scotland, Wales, Ireland, and the various British Isles that we now have. Even during the Middle Ages, England had a very different version of the English language (and spelling) than what was had during the Renaissance and even what became known as modern English post-Renaissance. When the English started colonising other lands (including the American continents), the English language saw yet more transformations when the language began to diverge in all these different countries. The English language has been one hell of an evolving beast since the beginning of time, and one that has been influenced by the various European empires that invaded the British islands throughout history. It was definitely interesting when Diana said how easy it was to learn the language given that reality, but then again, Themyscira isn't any ordinary state. After all, this is an island unlike any other. This is one in which mermaids, pegasus, unicorns, dragons, and other mythological creatures exist. It is also an island in which magic actually exists along with mythological gods. Since one of the major themes of the last two issues has been the presence of a mysterious 'outside force' polluting the island of Themyscira, do we know the extent with which this mysterious force has been influencing change on its inhabitants? We know it's definitely been causing Diana's aunts to conspire against her mother (their own sister), but have they also been subtlety influencing Diana's education for their own personal gain? If so, what do they hope to get out of it? Is Diana aware of this or will she eventually become aware of this once she starts meeting people outside of Themyscira and starts seeing the bigger picture? The existence of the modern English language on Themyscira alone is very thought provoking, especially when this issue also establishes that this same outside force got one of Diana's aunts (Antiope) to purposely crash Steve's plane on Themyscira. So clearly, that mysterious presence knows the existence of Americans. It's also worth noting that Diana's Aunt Antiope is the high priestess of Ares' temple, and Ares (sometimes called Mars) is a famous enemy of Wonder Woman. I wouldn't put it past De Liz and Dillon to be setting up Ares as the miniseries' main antagonist and gradually introduce his personal agents as the story progresses. Continuing the discussion on worlds colliding, the presence of Steve Trevor on this island is also important in more than one way. He not only presents a counterpoint to the Amazons by providing a modern perspective of the world, but we also see how the women of Themyscira react to the presence of a man on their island after so long, especially with their experience with men as they know it. His presence also allows Diana to learn more about herself and her personal values, and it especially showcases a very important trait of her character: her compassion for others who are not like her. A character trait that reflects in her decision to participate in her mother's tournament to decide Steve's fate against her mother's wishes. Undoubtedly, this is one of the most important chapters in Diana's story and one of the most exciting as it really sets into motion everything that will happen from this point forward. Queen Hippolyta is more aware of the danger Themyscira faces and her own sister's betrayal than she previously let on. Exactly where De Liz and Dillon plan to go with that plot thread is a mystery that keeps building onto itself. Antiope's own villainous transformation is also presented mysteriously in this issue as her exact motivations aren't actually known, but seems to be pointing in the direction of establishing Ares as the series' main antagonist. It even hints at a larger conflict happening amongst the gods with the more villainous Ares at the centre of it. The existence of the modern English language on an island that has cut itself off from the rest of the world is also mysterious. Could it be that the gods have been providing Diana with the resources for learning the language, knowing where she will inevitably end up? Is it all part of their plan to have her defeat Ares? There is definitely a lot of mystery being built at the conclusion of this first act that will no doubt influence the development of the story from this point forward. But De Liz and Dillon aren't just building the mythology of Wonder Woman for a modern audience. They are also reintroducing modern readers to DC's Golden Age continuity by building the entire world that Diana exists in. They are specifically building the continuity that eventually became DC's Earth-2 continuity pre-Crisis. For Classic Earth-2 and Justice Society fans like myself, this development is a real treat considering that we've been sorely lacking a real Justice Society comic for quite sometime. While I don't think it's De Liz and Dillon's intention to develop this narrative into a Justice Society book--it is after all, still Wonder Woman's story they want to tell--it is still a good precursor to eventually reintroducing that more classic DC superhero team in the future. Considering that Wonder Woman was a very important and prominent member of the Justice Society during DC's Golden Age (moreso than Batman and Superman, I might add), I wouldn't put it past De Liz and Dillon to eventually have Diana meet the team before this miniseries concludes. Considering that this week's chapter of the digital series revealed (through Etta Candy) that the Justice Society of America does exist in this universe makes me think they will eventually show up. I know I'll be really excited if they do! The more I read this comic, the more it becomes clear that Legend of Wonder Woman is both the Wonder Woman comic we should've gotten with the New 52 and the Earth-2 universe we should've seen as well. It's like De Liz and Dillon picked up James Robinson's original idea to make Wonder Woman Earth-2's first superhero instead of Superman, and actually developed the idea better. Like on the mainstream New 52 Earth-2, Wonder Woman is clearly being setup to be one of the world's first superheroes to emerge, but it's also being established that she isn't going to be the only 'wonder' who shows up. After all, this week also established that the Justice Society of America does exist on this world! The world that De Liz and Dillon are building honours and respects DC's past, but it also does something new and innovative with that established history. They're both like a modern day Roy Thomas when he wrote the All-Star Squadron comic in the 1980s. Whatever comes out of DC: Rebirth later this year, I really do hope DC extends more opportunities to Renae De Liz and Ray Dillon to develop comics for their mainstream continuity. I know after reading both this month's print issue and this week's digital chapter that I would love to see them completely take over Earth-2 for Rebirth. Right now, the sales for Earth-2: Society are in the toilet as of issue #9 and it's pretty clear as day this new Earth-2 has no future as we speak. If DC goes back to basics with Earth-2 for Rebirth, completely wipes the slate clean and starts over, I would love to see Legend of Wonder Woman established as mainstream canon for this universe. It's already on the right track with establishing Wonder Woman and the Justice Society's history to the World War II era, which is one of the things many DC fans has been missing since the reboot. So DC Comics fans, if you want to see the return of an Earth-2 that feels recognisable as Earth-2, a Wonder Woman that actually reads like Wonder Woman, and the existence of a proper Justice Society? Pre-order this comic at your local comic book store. The more people buy it, the easier it will be for DC to see that an audience for the Golden Age characters do exist. We can make it happen! This comic has everything that I and many DC fans want in a DC comic: thoughtful storytelling complete with a solid direction and amazing art. There is believable character development, and a great balance between embracing the more fantastical aspects of the DC Universe and incorporating a real-world texture to the conflicts the characters experience. This, in my opinion, is perfection! If this was adapted into a Hollywood film, I would be first in line to see the movie on opening night. For real!